The month concluded with a Bronze Drive a Diesel Day using firstly the Bubble and then the Class 31. The participants enjoyed themselves which is what it is all about. Meanwhile at base, the Station Team set about the Ladies building which is suffering from somewhat flaking paint on the facias. Some areas are rotten and do need attention but alot of it is just old paint. They started on the worst edge and scraped off all the flaking paint, flatted it back and then primed it fresh. Looking better already! Jack came and found the yard devoid of other humans but did find 8 sheep munching their way through the grass bank. Fortunately he had some hidden shepherding skills and managed to return them to the field near The Hannages from whence they came. Seems sheep can use foot crossings too! The fishplates on the new Miniature Railway were tightened ahead of the opening tomorrow. Derek was heat stripping paint from the Guards Compartment in the BSK. You would have been forgiven if you had thought it was October with today's weather. Rain and cold! Having said that, a more than satisfactory number of passengers enjoyed today's Blue Timetable. Down the yard, one portion of the Maintenance Team fitted a gearbox piston seal to one of the gearboxes on the Class 119 which was blowing through and the other team worked on the PW Bubble Car. They are specifically working on the engines at the moment, where many of the components have been sponsored by shareholders. One of the engines had many of the components missing and these have now been fitted including a starter motor, right angle fan drive, injector pump and some misc pipework as well. A test run up will be done off the vehicle before it is fitted. It is very handy doing this kind of work in the luxury of the new shed extension - dry, warm and clean! A slightly damp start to the day but it improved this afternoon. Passenger numbers were again good, beating yesterday. The gift shops also performed particularly well today. Down the yard, Team Faraday steam cleaned engine and interior components. Whilst the machine was set up, the Derby Lightweight power car also had the under frame steam cleaned. The RF kitchen car had a start made on the body work with some cutting out and welding done. The weather was kind today at Derbyshire's favourite branch line with the sun managing to break through on occasions. A fairly busy Duffield service today and the Jinty performed Flawlessly. I don't know enough about coal and the best coal to use or what type of fire to build but a big thank you to today's GCR crew, ably piloted by JHT, who ensured the train arrived and departed on time. The Ravenstor steam service was busy throughout the day. Down the yard the DMU team could be found working on the Derby Lightweight and Class 119. Worked continued on the EVRA SK and the Duke had a big end machined by Simon. (video on Facebook page). The LMSCA were also in restoration mode. The Miniature gauge team were in attendance making ready for next weekend's grand opening. Today's service was supported by the EVRA Shop, Pullman Buffet and Booking Hall staff. A quiet day for the large part. The Jinty was coaled and warmed up for tomorrow as happens every Friday at the moment. The Miniature Railway guys were putting the finishing touches to their project ahead of the proposed opening weekend after this. This is quite an exciting project and they have done really well to get where they are now. Currently, it goes from the end of Platform 1 at Wirksworth to just beyond the bridge but as time and money allows there is scope to go to the ground frame and beyond (Gorsey Bank??). The Commercial Department were in full swing showing a couple round who are looking to have their big day reception on the railway in December. Later this afternoon the guests started arriving for a private retirement charter this evening on 55006. Graham, who has brought us plenty of MyTestTrack business over the last 10 years as a rail accident investigator, is retiring and we wish him well. He may even become a volunteer, who knows? A reasonable Thursday with the three train DMU service happily running. Today's visitors also included a Stationmaster from one of the biggest heritage railways and he was very complimentary which is pleasing to know. The Maintenance Team shunted the coaching stock around earlier before turning their attention to fuelling the diesels. The CK has had the roof painted and some body side lining applied now its a little cooler. The new shed has been electrified with three phase power now for the first time and early indications show that the supply runs a welder well. A peaceful day for the longest one of the year. It was very hot again today so people weren't exerting themselves. The PW team were sorting items out down the line ready for upcoming work. Lots of envelopes were stuffed at Wirksworth for an upcoming mailout and that's pretty well it! It is worth mentioning that we have been awarded the TripAdvisor Certificate of Excellence again for the fifth year in a row and it will be with us shortly. Well done to all involved in making our customer experience a happy one. Another scorching hot day, perfect for a Father's Day train ride. Not quite as busy as yesterday because the pre-booked parties really made yesterday very busy indeed but still busier than Friday to put a perspective on to today. The Jinty ran all three return trips again today and the timekeeping was much better. One couple even enjoyed an impromptu on train afternoon tea, expertly laid on by the Catering Dept. There wasn't a lot of progress down the yard really because it was far too hot for them to be working inside coaches and DMUs. Some work did take place inside the RF kitchen car but even this was minimal due to the heat. What a scorcher down at Derbyshire's Favourite Branch Line. Temperatures of 27 degrees centigrade were recored at Wirksworth as our many visitors enjoyed this mini heat wave. Our visiting 'Jinty' struggled to keep to our timetable today with the last Wirksworth to Duffield service being somewhat delayed. 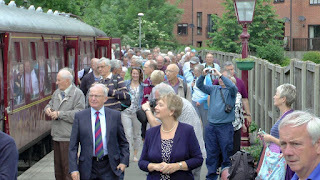 However, one of the strengths of our railway is how the volunteers and staff look after our visitors and a big thank you goes to Eric Hills our catering manager who went along the train enquiring about passenger onward travel arrangements resulting in Eric taking a passenger in his car to Duffield to ensure he met his two onward connections. A great example of our passenger ethos. 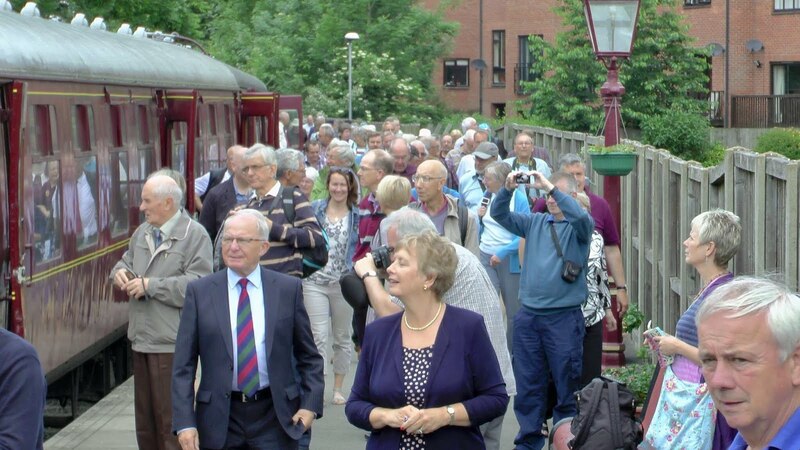 Our Duffield service enjoyed near full trains on all trips. Special mention to the footplate crew for their hard work and dedication in what must have been very uncomfortably hot conditions. Our Ravenstor service was very busy too and I believe it was the most successful to date for the number of passengers carried. Again, thanks to crew who were kept very busy working hard in such high temperatures. Down the yard the LMSCA could be found staining oak veneers in the BTC. The DMU restoration team continued the examination of the class 119 which requires a new exhauster. Tim Oak's band of restorers undertook a final skim of the Dukes's big end bearings. There were a number of volunteers found at the miniature railway working on the final few jobs before its grand opening next month. 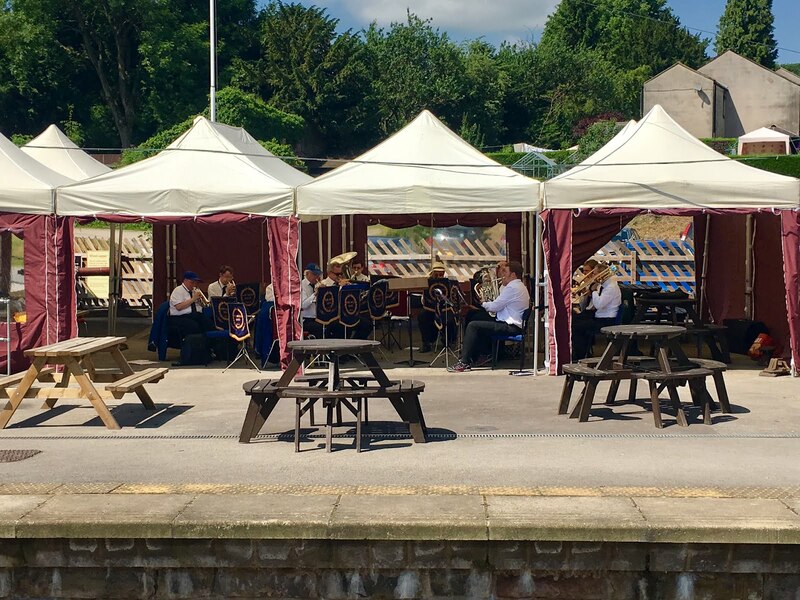 Passengers were entertained today on platform one by the New Mills Brass Band together with June who undertook a number of Yard Tours. Supporting todays service was the EVRA shop, Model Railway, Pullman Buffet and our Booking Hall Staff. Thanks once again to all the volunteers and staff who coped extreemly well with the volume of visitors and the unforeseen delays who ensured our passengers were kept fully informed and well looked after. Tomorrow is to be hotter so if your visiting, don't forget the sun block! Check out the automatic photo album with 3 photo(s) from this topic. 70 years ago today the LMS ran the last timetabled passenger train to Wirksworth. In commemoration, EVRA members were given the opportunity to ride on our celebratory train. The Lord Lieutenant unveiled a commemorative plaque at Duffield this morning too which marked the occasion. The 150 Years headboard looked great on the front of the engine, although I was too busy to be able to get out of the office to take a photograph unfortunately as we had large numbers of visitors. Another beautifully sunny and warm day saw reasonable passenger numbers, with Iris being quite well loaded on the first train. Down the yard, work continued on the Class 119 whilst steam was raised on the Jinty for the random Friday operation tomorrow. Quite a peaceful day in Wirksworth. One of the only days this week with no trains running. The PW team were out and about down the line but other than that it was rather quiet. The Maintenance Team continued work on a big exam on the Class 119 and the coaches were cleaned ready for later in the week. A rather overcast day here at Derbyshire's favourite branch line. Down the yard the DST turned their skills to a leaking gauge glass on Henry Ellison which was prepared for service this weekend. As too did the Jinty with a few minor repairs being attended to. Work on Cathryn continues with replacement of missing bolts, taper pins, split pins and lubrication piping. Work on the vacuum chamber also continues. The DMU association continued with an exam on the Class 119 now that the throttle problem has been rectified. The Permanent Way were in attendance too conducting a track patrol. Today's afternoon tea train was hauled by loco '31206' and was fully booked with the on board staff receiving many compliments on the quality of food and the service provided. Today's service was supported by the EVRA shop, Model Railway and Pullman Buffet. 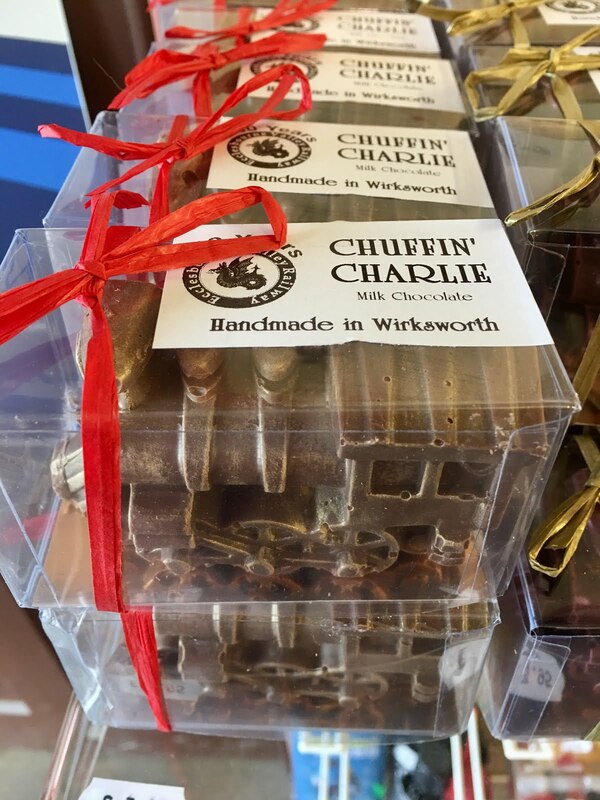 Please don't forget you can now purchase a range of Ecclesbourne Valley Railway confectionary in the Wirksworth Booking Hall! Quite a rush of passengers for the first train of the day from Wirksworth led to great promises of a fantastic day, but in the end, it didn't really turn out to be. In fact, it was quieter than yesterday. Nevertheless, another day, another diner, for the Catering Department as they served 33 passengers a light lunch on board the 13:20 and return. Down at the shed, an assessment of work was made on the RF kitchen car with a view to some metalwork starting soon. This will probably begin initially on the floor sections which can be done regardless of the weather. Also in the metalwork department, stripping of rotten bits from Faraday continued with an area of the cab today. It now looks like a sports loco actually, just right for the addition of a soft top. A very wet start to the day but it did dry up late morning although it was overcast for the rest of the day, the train services today were being handled by the Class 3F Jinty on the Duffield service and Henry Ellison on the Ravenstor branch. Passengers numbers were resonable and steady throughout the day although were affected in the morning with coldwell street being shut from 9:30 until lunchtime to allow for the aviva women's tour 2017 cycling event to pass through the town. Down the yard the LMSCA continue there work on the BTK and also the 8f group were working on the Duke. The new shed extention facilities were put to good use today with the derby lightweight power car and Faraday inside the new shed extension work can now continue in the dry on these two projects. On the derby lightweight work continued on the underframee scraping all the years worth crud and muck off and painting it all black once done all the mechanical components can start to be refitted. And on Faraday the engine bay covers and radiator grill were removed for repair and repaint this will also allow the cab to be welded where needed and all the mechanical components and the radiator to be steam cleaned.And that's all for now. Coldwell Street, outside Wirksworth Station, is closed Saturday 10th from 09:30 until approx. 12:00 for a cycling event. We recommend visitors either a) catch the train from Duffield at 12:10 and use the car park there or b) catch the 13:20 or 15:15 from Wirksworth in order to avoid this closure. A sunny and peaceful day where we hosted a Silver Drive a Diesel Experience. This is the one where just one guest effectively hires the line for the day. He drove the Bubble this morning followed by the 31 this afternoon. He was like a duck to water and apparently a breeze to supervise but sadly won't become a volunteer due to only being on holiday here from Cyprus. Another day of heavy rain did nothing to encourage people to ride on the train but having said that it was better than Tuesday. The first train also had a coach party on board which also helped boost the day. Down the yard, Iris received a post lorry exam to ensure she is good for service and the contractors continued fitting the roller shutter doors to the Maintenance Facility. The PW team were working just north of Duffield changing sleepers and probably getting wet. A better day weather-wise allowed the PW team to trip a wagon up to Wirksworth for use next week. It is rare at this time of the season that there's an available day! The Maintenance Facility was shunted to get vehicles in the right position for future work and a start made on fitting the new roller shutters. We welcomed Iris back from her holidays at the Llangollen Railway this weekend. She performed faultlessly at the weekend in multiple with all sorts of different DMU classes including the equally as special Class 109 "Wickham" or the Class 127 diesel hydraulic unit. Picture is showing her in the evening sunshine at the picturesque station of Berwyn. Today we hosted a charter for the Lagonda Tour of the Peak District 2017. They had a ride through the valley with a talk about the railway, followed by a ginormous buffet in the Pullman. Thank you to everyone for coming in extra to do this as it was really worth it. Unfortunately, the VCT were a little rained off! Sunny weather brought out the visitors today as our second Saturday of steam services on Duffield and Ravenstor lines enjoyed good loadings. Following some attention by the DST to a piston gland the visiting 'Jinty' performed faultlessly. Down the yard the LMSCA and the Duke's restoration team worked on their respective projects. Today's service was supported by the EVRA shop, Model Railway and the Pullman Buffet. Incidentally, keep a look out for some new products being sold in our station shops next week. 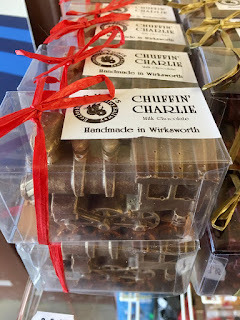 These include 'Chuffin' Charlie' (our very own locally made Belgian chocolate steam loco) and 'Winston the Wyvern' (a delicious chocolate dragon) not to mention IRIS Pale Ale being offered for sale in our on train buffet! Can't quite believe that it is June already! A nice sunny day at Wirksworth saw the weekday passenger service bobble along at a steady pace. Rather sedate after the weekend and Tuesday's services but pleasant all the same. The Maintenance Team began a mechanical examination on the Class 119 whilst it is out of traffic and the steam team filled the water up on the Jinty ahead of the weekend. The PW were sorting out materials down the line. We waved goodbye to Iris yesterday as she pops over to Wales for a week's holiday at the Llangollen Railway. It has been 9 years since she last visited.